Note - The front-to-back rail spacing must be at least 392 mm (15.43 in.) and not more than 504 mm (19.84 in.) from the outside face of the front rail to the outside face of the back rail. 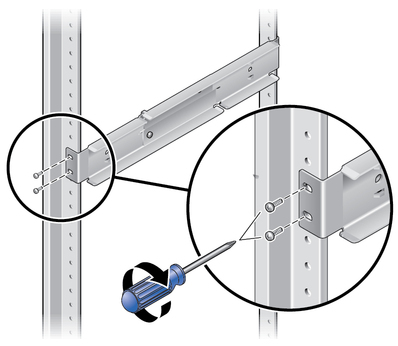 Loosen the two screws at the middle of each adjustable rail so that you can extend the adjustable rail. Lift one of the adjustable rails to the desired location in the rack. Using two screws, secure the front of the rail in the rack. The size of the screws varies, depending on your particular rack. 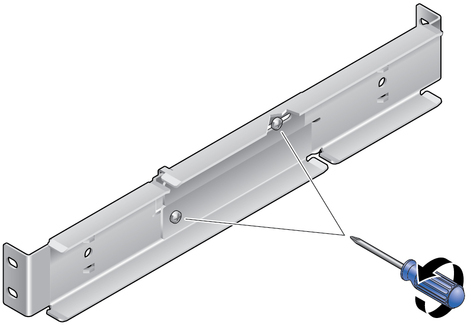 At the rear of the rack, use two screws to secure the rear of the adjustable rails to the rack. Tighten the two screws at the middle of each adjustable rail. Mount the other adjustable rail into the rack. Repeat Step 3 through Step 5. Using one M5 x 7 SEM screw for each rear flange, loosely install the rear flange onto the rear of each of the adjustable rails. 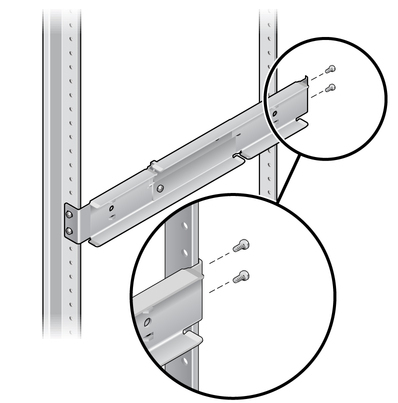 Do not completely secure the rear flanges to the adjustable rails. You will use these flanges to set the rack depth for the server in a later step. Using eight of the M5 x 7 SEM screws (four for each side rail), secure the side rails to the sides of the server. 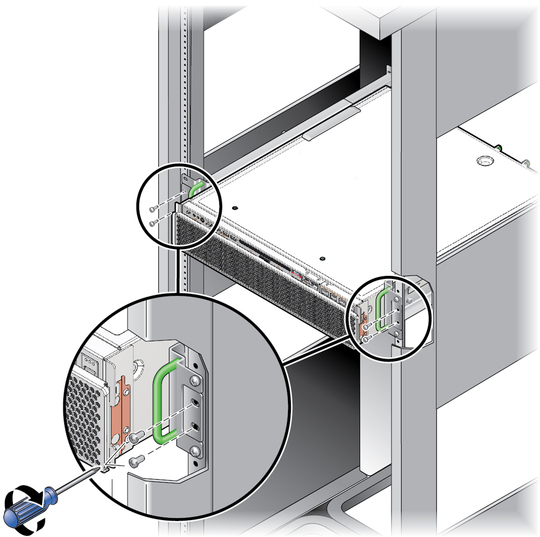 The side rails can accommodate rack rail setbacks (the distance from the front of the rack to the rack rail) of 50 mm, 75 mm, or 100 mm, depending on the type of rack you are installing the server into. 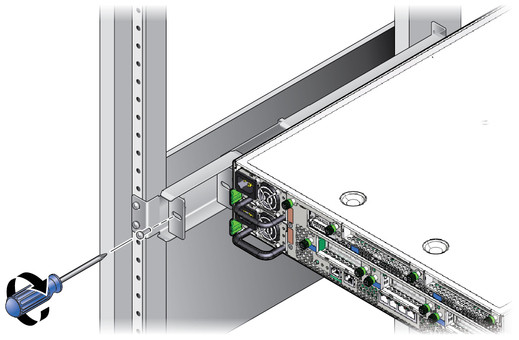 Lift the server into the rack and slide the server onto the adjustable rails. Push the server to the desired depth in the rack, then go to the rear of the server and push the rear flanges flush against the back of the server. 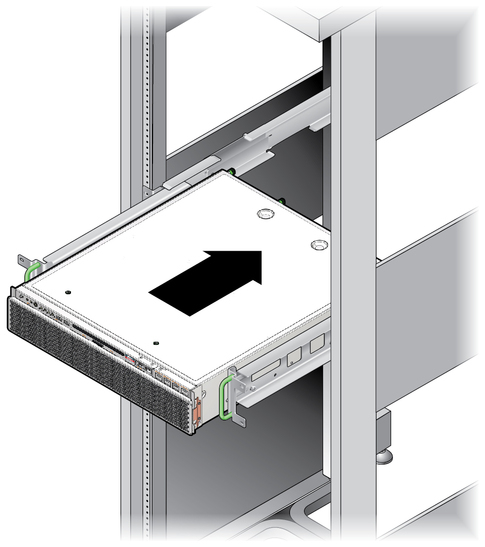 If the rack is especially shallow, you can flip the rear flanges around so that they rest flush against the rear of the server. Lift the server out of the rack. Set the rear flanges to the desired depth in the rack, then tighten the single M5 x 7 SEM screw on each of the flanges to secure them to the adjustable rails. Lift the server into the rack and slide it onto the adjustable rails. 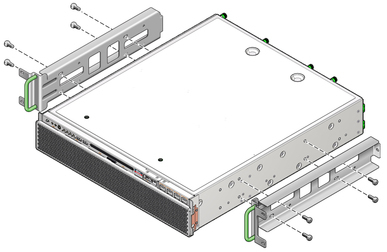 Push the server backward until it rests flush against the rear flanges, then use one M5 x 7 SEM screw for each rear flange to secure the rear of the server to the rear flanges. 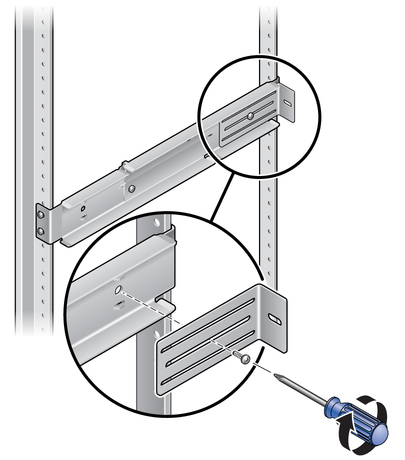 At the front of the rack, use two screws per side to secure the side rails that are attached to the server to the front of the rack.